COAI or the Cellular Operators Association of India announced that their “SabkaInternet, Sab ka Vikas” campaign received support from over 40 lakh Indian mobile users in under a week’s time. Interestingly, the press release states that SabkaInternet is actually a campaign for Net Neutrality, Net equality and consumer choice. We have published articles earlier that clearly points that the basic premise of SabkaInternet is actually against Net Neutrality. Infact, it is a deliberate attempt by COAI to confuse people about a subject that already not understood by majority of users. The real question is – Whether these 40 lakh people who supported for SabkaInternet Campaign know what they have approved of ? 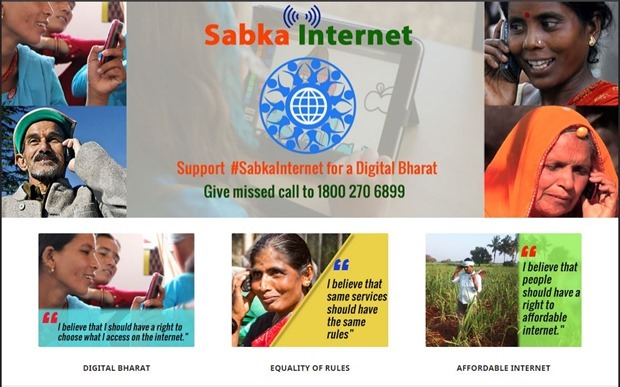 On 22nd April, COAI launched a hurried campaign called SabkaInternet, and every statement and content that came out from this campaign was carefully engineered to disguise actual reason behind it. Even as of today, the campaign has a single page website that only has phrases that give a impression that this is a initiative for everyone’s benefit. Have a look at this page. The entire page has phrases like “Support #sabkainternet for a Digital Bharat” or “I believe that people should have right to affordable internet”. For 99% of people, these statements are clearly positive and something that they will not think twice to extend their support. What’s even more is, COAI has time and again said that #SabkaInternet campaign actually supports net neutrality. It’s very simple – if you read the telecom operator’s responses (except Reliance Jio) to TRAI consultation paper on OTT services and Net Neutrality, it is clear that they want to charge separately for OTT services with premise that these OTT services are eating into their revenues. In other words, it means, they want to charge separately for WhatsApp, or Facebook or Twitter and other services. While they may give it even free or at very affordable rates, they are discriminating (positive or negative) between different services on the internet and hence breaking Net Neutrality. So, COAI saying that they support Net Neutrality is completely a hogwash. Do remember, COAI is association of these Cellular operators, so While Sabka Internet speaks of Net Neutrality and Net Equality, in reality they want to break up internet, which may prove to be too costly for consumers in coming years. Airtel Zero and Internet.org are prime examples of such discrimination which were initiatives launched by Airtel and Reliance respectively. Interestingly, Airtel had slammed Internet.org initiative exactly for the same reason and who incidentally went on to launch a very similar service just few weeks later. Bottom line is – Out of 40 lakh people who supported #SabkaInternet campaign, most of them have little idea about the reality of this campaign. You can read our coverage in regards to Net Neutrality here.